There are some books that intrigue you by the name itself. This is one such book. When you see the title “Ghost in the Machine”, you’d think it’s more of a children’s fiction than a crime-fiction. Even the cover does very little to make you think any different. So your interest is piqued. The book begins with a scene where a woman is pushed into a room as she feels a rope biting her neck. The woman turns up in a missing person’s report two days later and is handed to Detective Constable (DC) Scott Cullen, at Lothian and Borders police, to look into. He begins his investigation with Acting DC Keith Miller and does the usual meeting the friends and family and looking to the welfare of the woman Caroline Adamson’s son as well. He doesn’t get wind of anything untoward happening with her until the morning of his day off when Caroline is found dead in a hotel room. The investigation now continues into her “death” as they look at the pool of suspects including someone the woman met on a social networking site. As the investigation continues, so does the crime as we more twists and turns. Through the investigation, Cullen’s way is hindered in no small amount by Bain, the Detective Inspector he reports to. Bain thinks he’s already got the criminal, and looks for proof to complete his case, giving Cullen very meager work. It’s like a contest to see who solves the case first. It’s a good plot and keeps you interested in knowing what actually happened. Just when you think the case is near solved, a twist comes in and keeps you interested. Towards the end, to an extent, you do know who the culprit is most likely to be. Though curiosity to know the ending does keep the read going along at a decent pace, I was a little uncomfortable with the Scottish accent words. I do give the author points for keeping the local dialect though, because it made an effect on the originality. Thanks Leo - glad you enjoyed my book... Seem to have had a spike in downloads as a result of your review, and I'm currently 119 in the Free charts in the UK, which is brilliant. Eager to see if you enjoy the other two books in the series as much. Hi Ed. Yes, enjoyed your book very much and good that you've peaked in the number of downloads. I'll see if I can download the other two. Don't have a credit card, so currently limited to just the free editions available on Kindle. 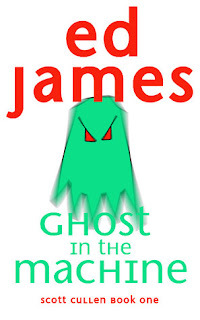 Send me a mail - edjamesauthor@gmail.com - Thanks! Great review Leo, I really enjoyed this book and have read the whole series (now desperately waiting for the next one). I'm from the area Ed writes about and for me the use of local dialect (and the smooth, believable mingling of invented landmarks and places in the reality of a country I know so well) were high points of Ed's work.